I was tagged by YouMeFriday to do the ‘seven deadly sins of beauty’ tag. I have watched a few youtubers do this tag and it is quite unique - here is my version. 1. Greed: What is your most expensive beauty item? My most expensive beauty item(s) are my Dior palettes or my Burberry eyeshadow quad. I have a couple of Dior palettes from my holidays which were around $68. My Burberry quad was £40. 2. 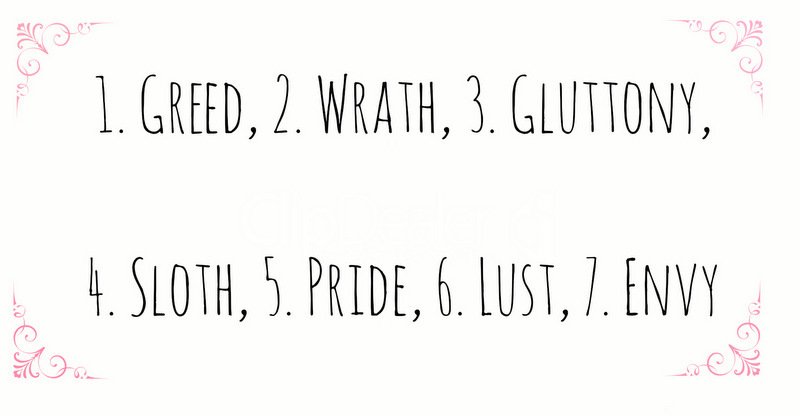 Wrath: What beauty item do you have a love/hate relationship with? My Benefit Hello Flawless Foundation. I love the finish, application, wear and feel of this product but the shade is too dark for me - I believe it I have the lightest shade. I have the shade ‘believe in me ivory’ but I can’t wear it because it is too dark! 3. Gluttony: What makes up brand is the biggest chunk of your makeup collection? I have quite a lot of products from Rimmel, Revlon and Kiko - I have a lot of cosmetics from numerous brands. 4. Sloth: What product do you neglect to use due to laziness? Probably face primer. I love primers and I use eyeshadow primers every time I do my makeup but I am a bit lazy when I comes to face primers - I usually forget! 5. Pride: Which beauty product gives you the most confidence? Base products like concealer and foundation - mainly foundation. When I have foundation on and my skin looks better, it makes my feel better about my appearance. 6. Lust: Which item is at the top of your beauty wish list? The Chanel Illusion D’Ombre cream eyeshadows have been on my wish list for a long time. I will have to treat myself as I received my last assignment grade for uni today (now I am just waiting for the overall grade in June). 7. Envy: What makeup product looks great on others but not your self? I think smokey eyes look great on most people but I don’t think they look right on me as my eyes are fairly deep set. I always neglect face primers, they're one of them where I'm like ahh nah I can get away without... mistake! I love them and they make a huge difference when I can be bothered. I'm enjoying reading your posts.